I was honoured to have MY story published in the Visual Arts Voice, Fall 2014 - a CARFAC BC publication. Enjoy the read. 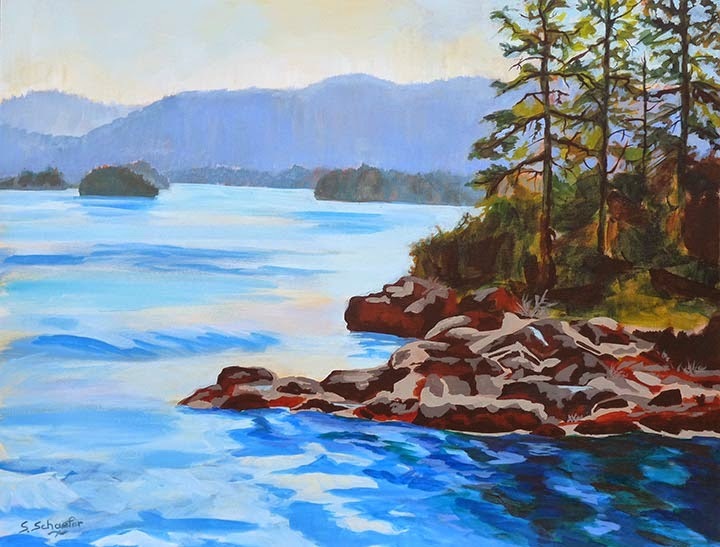 Susan Schaefer – From the Prairies...to the West Coast...and Beyond! As my 55th birthday draws near (yikes), I look at my life as an artist. I sit here from the living room of my Qualicum Bay home / studio typing on my lap-top. My husband Jeff or L & L (lover and lugger - as he likes to be called) is typing on his iPad. 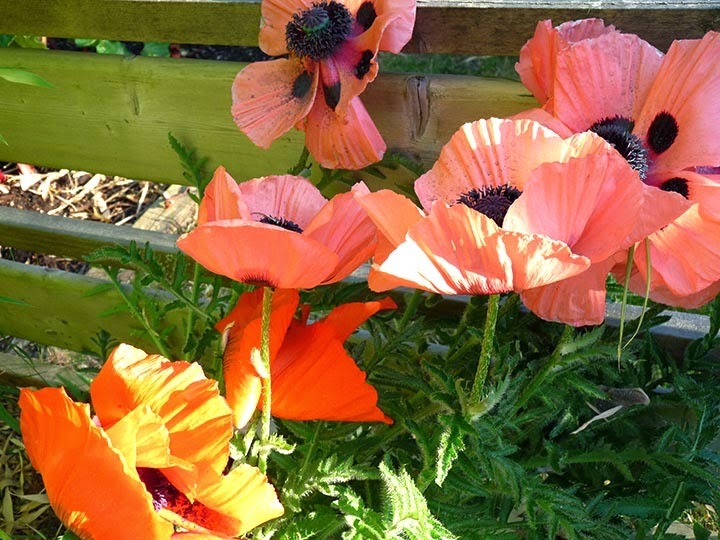 We have a beautiful garden which we both enjoy and a spectacular ocean view. 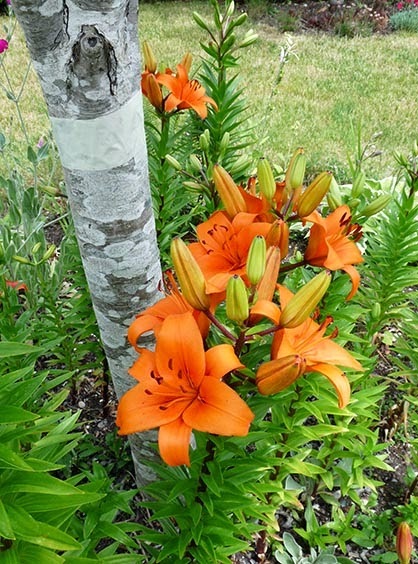 The summer breeze is gently blowing and I feel truly blessed to be here, on Vancouver Island at this time in my life. As far back as I can remember I was drawing, colouring and playing with colour. Growing up in rural Saskatchewan, the only thing we had to colour with were pencil crayons and wax crayons. I was a nerdy kid, who absolutely loved to get geography homework. Sounds weird right? That meant that I could colour in the maps, shading the edges of the ocean from light to dark as it went further from the shoreline. With wax crayon I could take a pencil sharpener, shave off the wax and use mom's iron to melt it down into some cool and interesting shapes. Not so good for the iron I was told. Sorry mom. It was in the year 2000 when my art career went from being a hobby to a profession lifestyle. I was living in Saskatchewan in a lovely “little house on the prairies”. 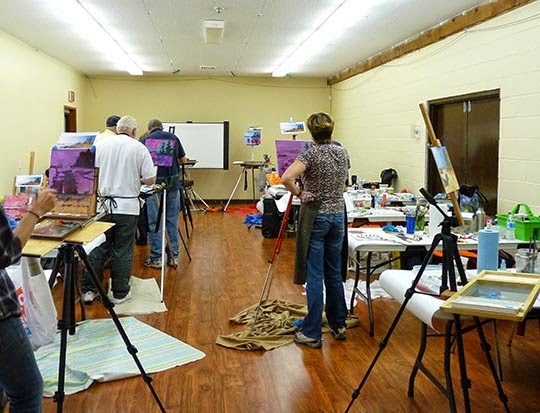 I joined the local artists guild and organized art workshops. 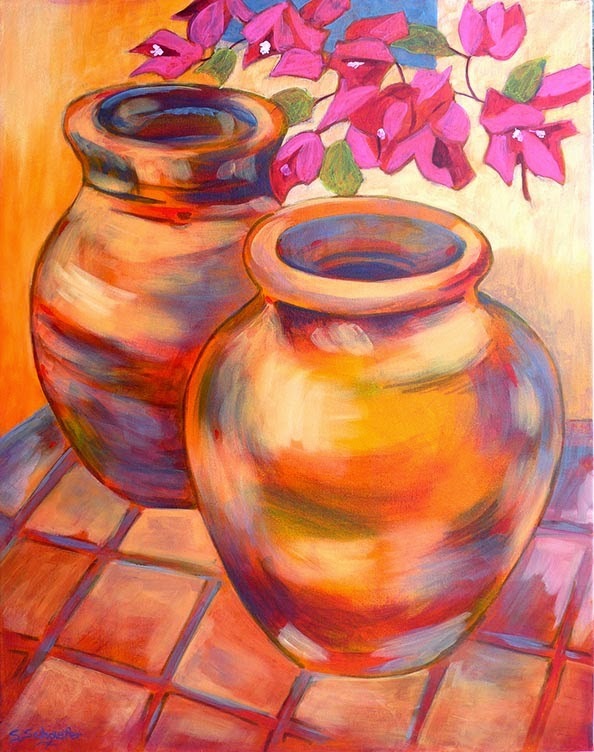 I started working in watercolours, but as my confidence grew I branched out into acrylics and oils. One day a girlfriend said “you should have an art show right here in your house.” That was a scary thought. I gave in and invited 5 ladies over for a glass of wine and some nibblies. That evening I sold 3 paintings. Wow – that was great. From then on I had a yearly art show in November (as that is my birthday month), at my home studio. I invited more and more patrons each year and made sales, but more importantly, many friendships were formed. In 2007, I moved to Qualicum Bay on Vancouver Island. 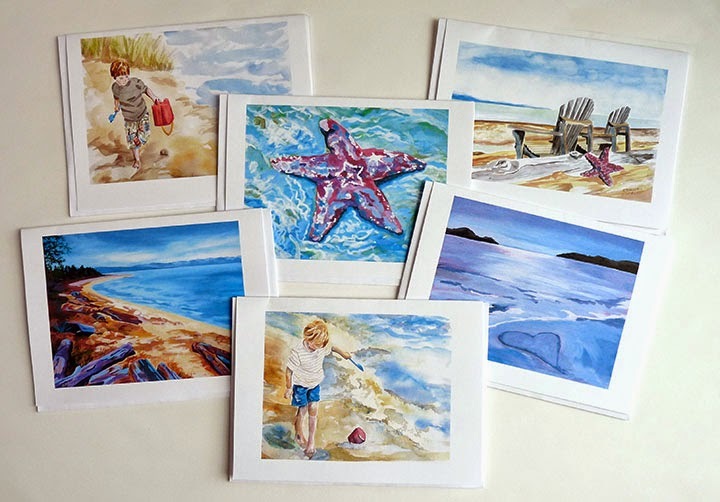 For the first few months I explored the island, painted and joined a few art groups. That winter a friend of mine invited me to go to Mexico with her. I love going south, as it gives me a fresh outlook on things. While there, I decided to 'go for it' and create an ARTS Magazine to showcase west coast artists. With a graphic-design background and very proficient on a Mac computer, in March of 2008, the Island Arts Magazine was launched. Another scary endeavour, but I thought “If not now, when?” We have just published our 27th issue and the magazine is going strong with subscriptions across Canada and into the USA. And it is still FUN to create. 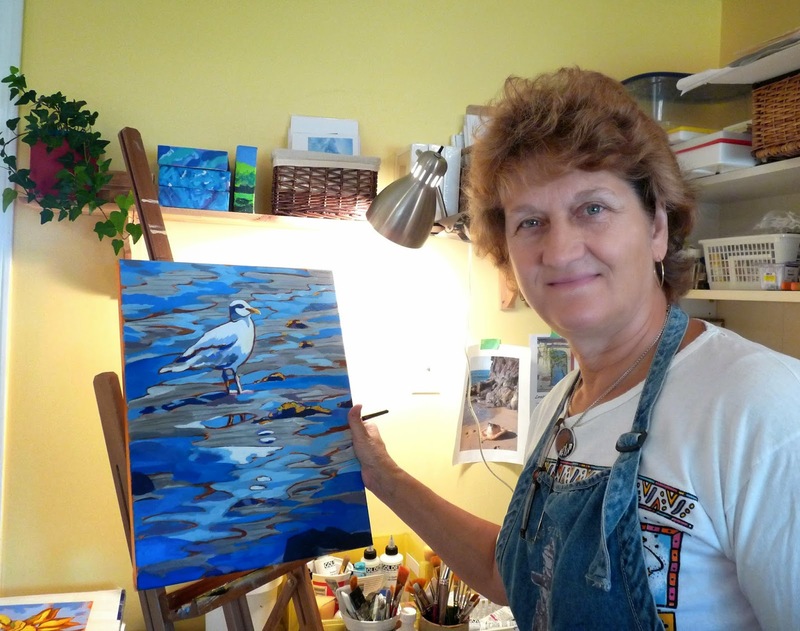 Through the Island Arts Magazine, I was able to meet many wonderful artists up and down the island. We also get invited to and sponsor amazing events. For the past 5 years we hosted the Island Arts Expo, a weekend of workshops, artists talks and exhibition of artwork. After 5 years, we decided to move onto other endeavours. 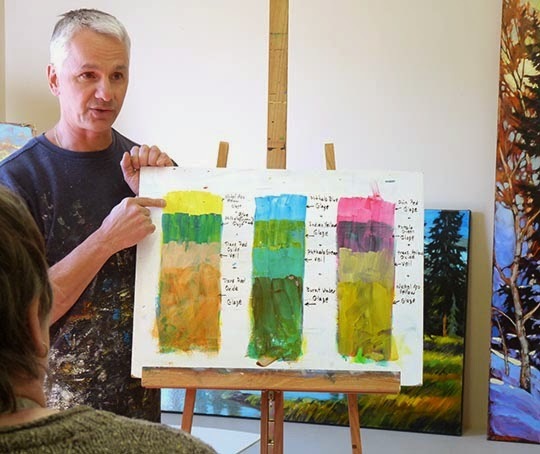 In the last few years I have been organizing workshops in Qualicum Bay, bringing in artists from across Canada from whom I wish to learn. I keep further involved in the 'goings on' by volunteering at local galleries. I spend a lot of time marketing my work, which pays off as I have collectors across Canada. Recently I received a commission from a patron in Mexico which we will be delivering in December. What a burden! I feel very fortunate that I can do what I love, and have so much fun doing it. It is a great feeling when you have created something from your heart and then someone loves it enough to include it in their life. I am truly grateful and I am excited to see what I can accomplish in the next 55 years. After almost two years in the planning, this past weekend, Island ARTS Magazine hosted a Suzanne Northcott workshop. The title was "Working Big and Loose". I was excited about this workshop, as Suzanne has a reputation as being a great facilitator. Second I felt a nature push to start painting bigger. Everything was in place for an exploratory experience. First we were to scrub and brush some paint down to cover our canvas with an under-painting. It didn't much matter what you did, as some or most of the under-painting would eventually get covered over. 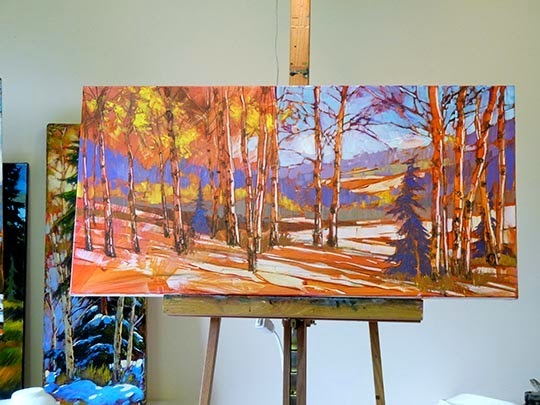 I tend to reach for the warmer colours - quin gold, red and yellow. 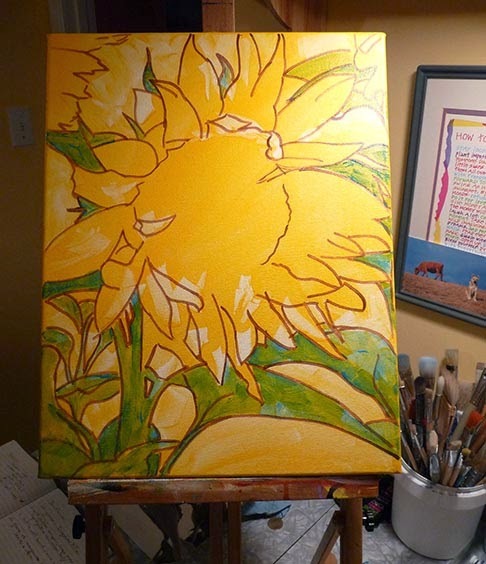 From there I roughed in a few shapes, standing back from the canvas, using a large brush and making marks on the canvas (as Suzanne would say). After a day of standing and working BIG this is how my painting progressed. Day two I experimented with copper foil and texture. I felt like a mason as I trowelled on the coarse pumice to get the effect of cement. A week has passed since the workshop and this morning I finished the painting. 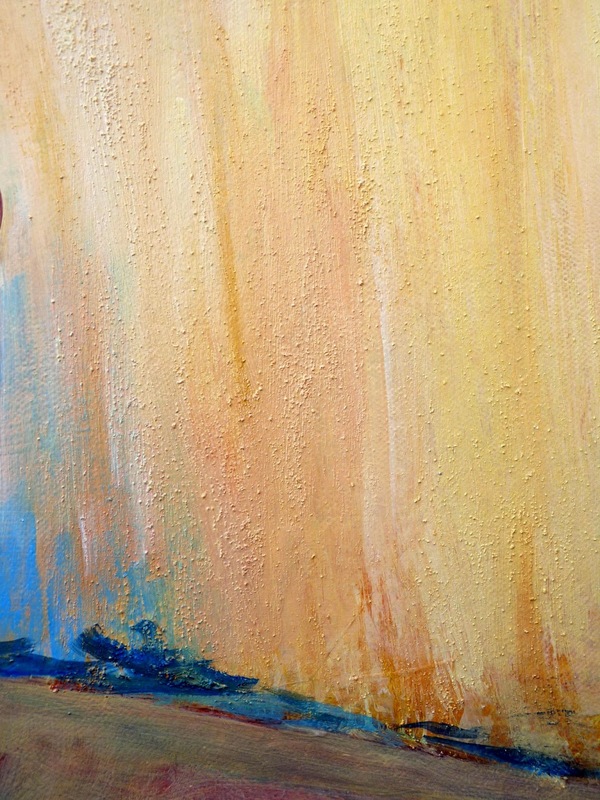 "South of the Border", 30 x 24"
I'm ready for my Saskatchewan Exhibition - Celebration of Colour. 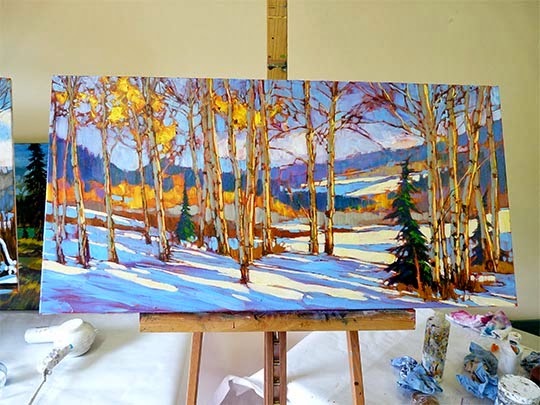 We are packing up the car on Sunday and heading out to the prairies for our bi-annual art show in Fort Qu'Appelle, Saskatchewan. I lived there for 7 years and I have a strong following of patrons. It also gives us an excuse to go on a beautiful drive through the mountains visiting friends and family along the way. Last fall, after deciding on a date for the show, I went on a quest to find a venue. Fort Qu'Appelle is not a big place, approximately 2500 folks call it home. There are a few vacant buildings in town, which I could rent, as well as an arts centre. I first approached the arts centre to book the show, however, unfortunately I was unable to negotiate a contract with them. I decided on renting the Old Train Station which now is the information booth. 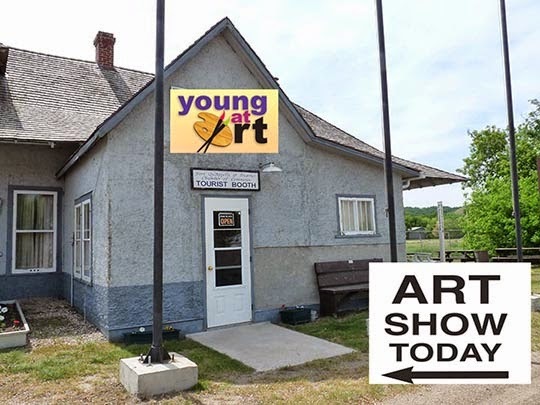 It is centrally located, right on highway 10 and a funky place to have an art show. It closes after labour day weekend, so I can have the whole building to myself. Cool! A month ago I mailed out my invitations. Yes I still like to use Canada Post for this. I believe receiving an actual invitation in the mail is powerful and makes an impact. A paper invitation can be put on the fridge or stuck on the wall in your office as a constant reminder. I sent out email blast invitations as well and did my due-diligence with Facebook postings. I set up a gallery page on my website with a preview of some of the paintings that we are taking. Next I sent a press release and advertisement to the local newspaper, to be printed a week before the event. I also sent press releases along with images to arts councils and newspapers within 100 mile radius of the event. Yesterday I talked to my mom about making me a nice sweet treat to serve at the show. I thought she would like to contribute to my success. Thanks mom. Once we are there, I have posters to put up around town, a liquor licence to buy, pick up the key to the old train station and set up for a 'really big show'. I have been busy getting ready for an upcoming art show. My intention was to book a show in Campbell River to get some 'up-island' exposure. When the opportunity to be "feature artist" for the month of July at Impressions Framing and Gallery came up, I thought it was a stellar idea. It also coincides with their annual River City Arts Festival on July 26th. That will be a blast! I sent out a press release to the media, four weeks in advance. I was thrilled when the Parksville Qualicum News printed an excerpt in their paper, along with the full version online. It will also be picked up by EyesOnBC in the July issue. I have sorted through my paintings, and picked the ones for the show. This was not an easy task as it involved spreading them all over the living room and not being able to use the couch for a nap until I had made my final selection. For marketing I made a calendar and art cards. The calendar I started in May, so it only needed a few final adjustments before zooming it into space for my printers. I have been able to stream-line the card making process making it quite painless. The response to the cards has been wonderful. I am just waiting for the calendars to arrive (on time please). Last but not least on June 30th we will pack the car (by we I mean Jeff) and deliver the paintings, calendars and cards to the gallery. Timing is everything, my friends, as a late afternoon delivery, means a dinner out in Courtenay. See you at the show. Take home some ART that you LOVE. 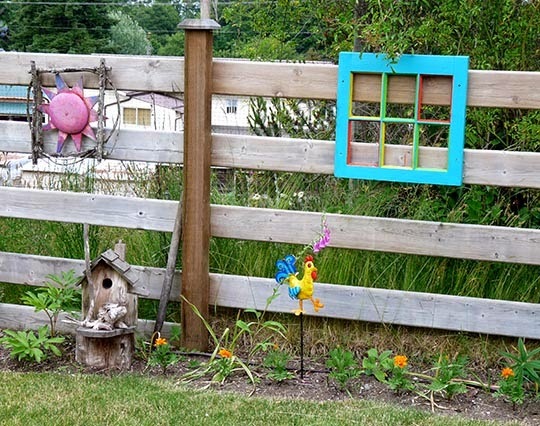 From the frogs and iguanas painted on the garden shed, the metal sculpted bird feeder, to the turquoise window frame hanging on the fence ... my back yard is a work of ART. 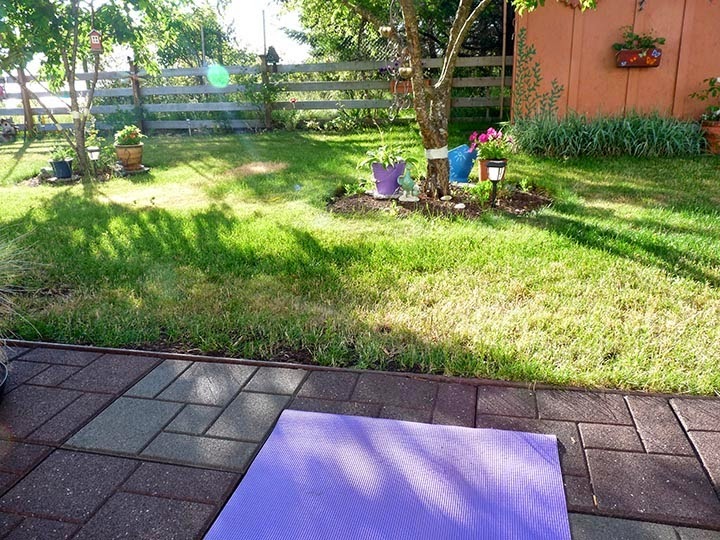 Mornings are blissful as I stretch out the yoga mat on the patio and breath. The warm sun caresses my face and birds discuss their daily plan as I stretch up to begin my sun-salutations. I love my new patio as it provides a place to relax and think about nothingness. 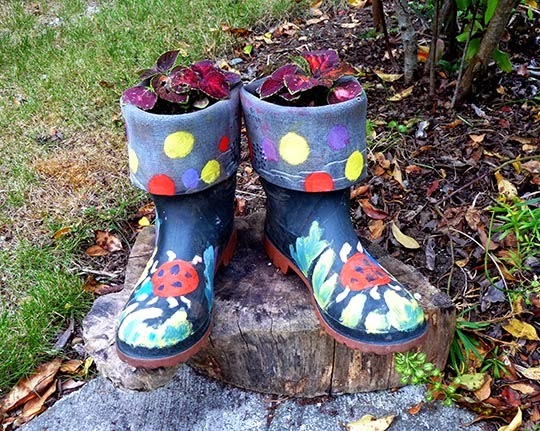 I have a hard time throwing out old rubber boots, as they too can re re-purposed and turned into another growing place. 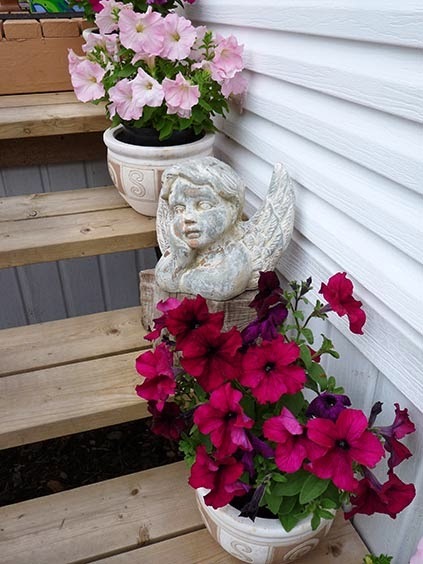 Petunias are always one of my favourite flowers, as they seem to bloom forever. After taking a recent workshop with David Langevin, I thought it was time to practice using glazes. 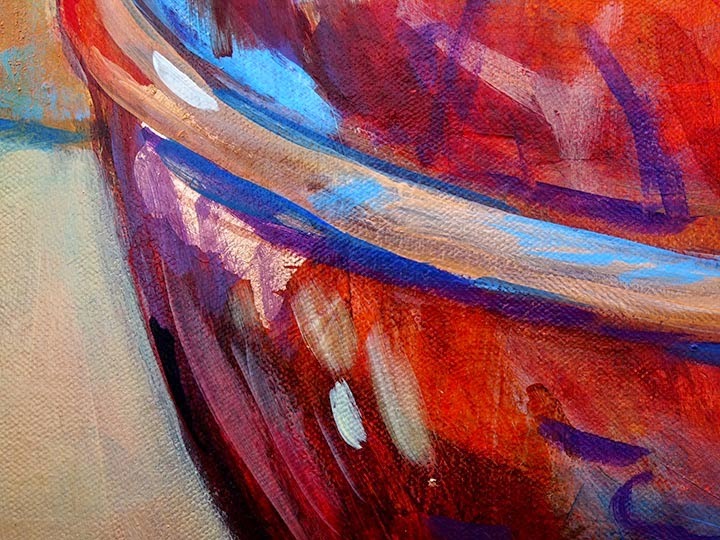 David works with glazes and veils, building his paintings up layer by layer. After going through several pages of notes, I decided to give it a try. 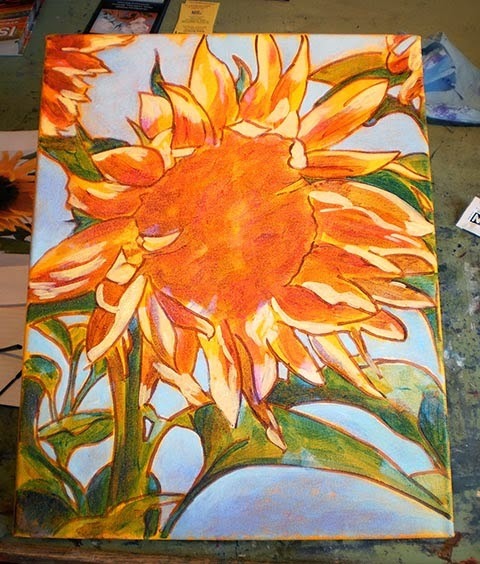 I picked my subject, sketched it out on canvas, and primed it with a warm Quin gold veil. 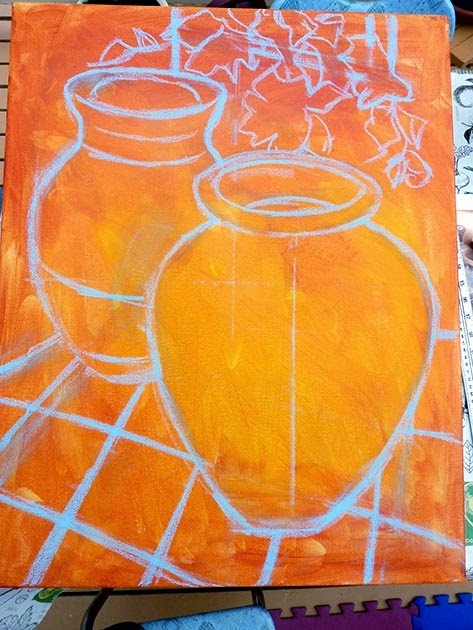 I then methodically started to paint, step by step, recording each step on paper and with my camera. 20 steps later ... I had a painting. In the beginning: manganese blue glaze over the leaves and the stem, makes a nice green. I purposely put the glaze on thinner and thicker in some areas adding more interest. 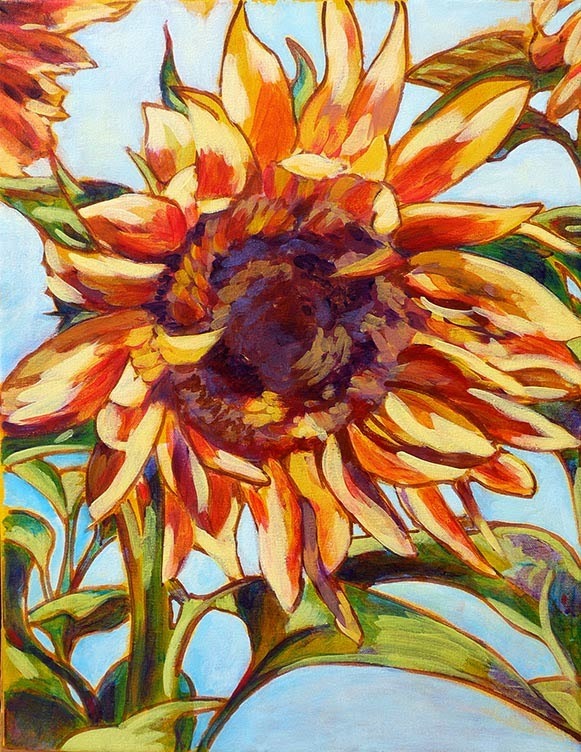 A glaze of quin gold really warmed up the sunflower and a veil of manganese blue cools the sky. 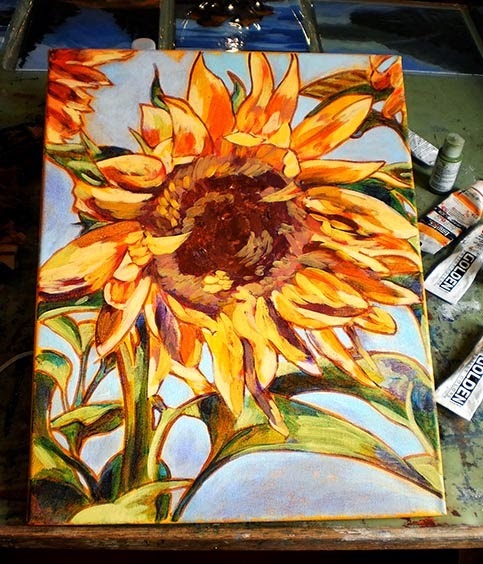 A glaze of quin magenta helps define the petals of the sunflower. A lot more layers: glaze of purple dioxine, yellow veil for the highlights, another gold quin glaze and more blue veils in the sky. 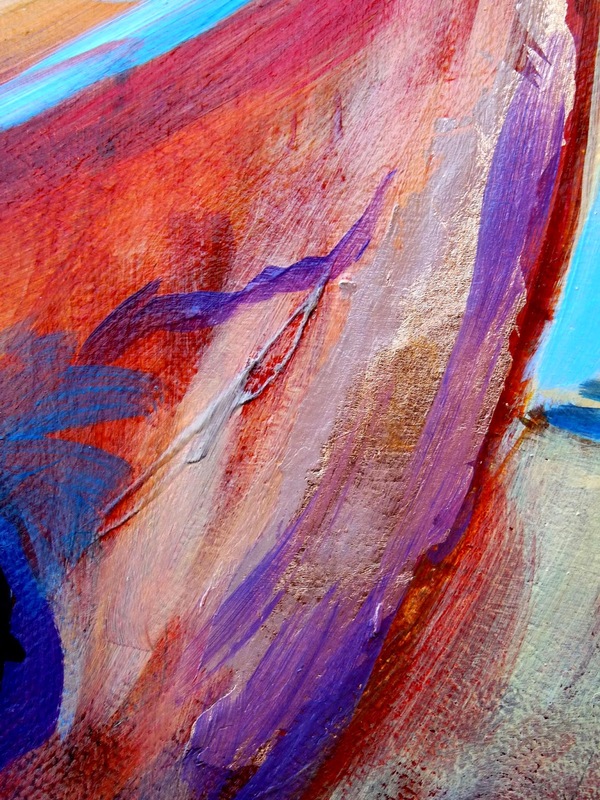 As you can see from this closeup there is much going on as different layers of colour show through. I enjoyed this challenge. It is a more controlled way of painting then I am use to. You must think about each layer and the effect it will have on previous and subsequent layers before applying it. 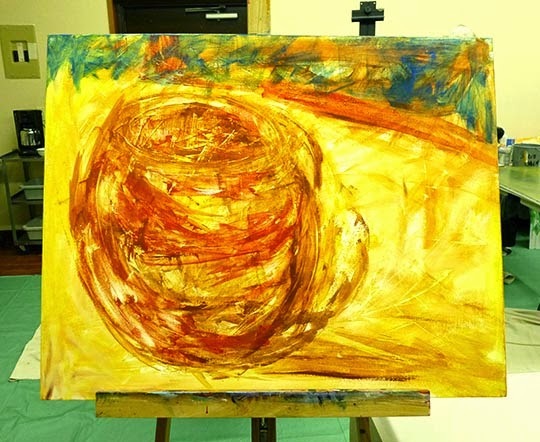 It is a fun way to paint with very interesting effects. As David Langevin would say "Only Caravaggio and Langevin paint this way." And now maybe Susan Schaefer can be added to that list? On my trip to New Mexico last year I took two cameras with me. I didn't want to risk having one camera conk out. I took hundreds of photos, not wanting to miss anything. 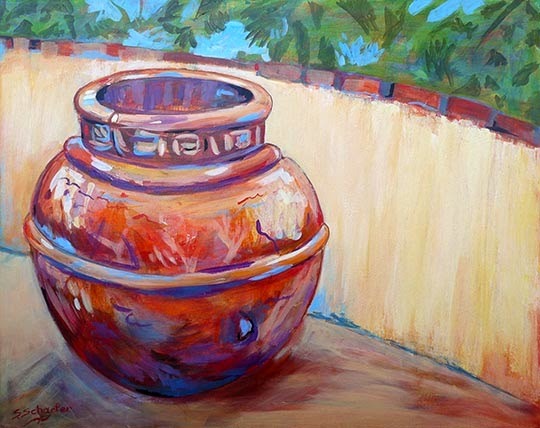 When I am in the mood to 'paint New Mexico', the hardest problem is deciding what image to use. I can spend hours going through the photos, happily drifting back into time. Although I usually work from photos as a reference, at some point the painterly muse takes over. Below are samples of my paintings, with the reference image on the left and the finished piece on the right. "Colours of Santa Fe", 8 x 8"
The photo was taken on Canyon Road, known for its hundreds of galleries. The streets are lined with warm colours, turquoise painted windows and doors and mucho big potted flowers. "Taos Pueblo Traditions", 8 x 8"
A tour of the Taos Pueblos was, for me, one of the highlights of the trip. I was drawn to the simplicity of the lines of this design. In the end, I felt it needed a bit more colour, thus I added some strokes of grass in the foreground plus a design in the window curtain. 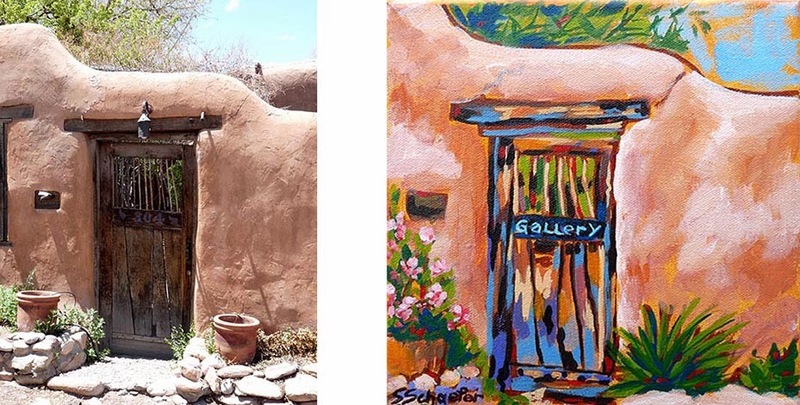 "Santa Fe Gallery", 8 x 8"
The curves and colours of the adobe buildings was so inviting, and what I would call the real New Mexico. 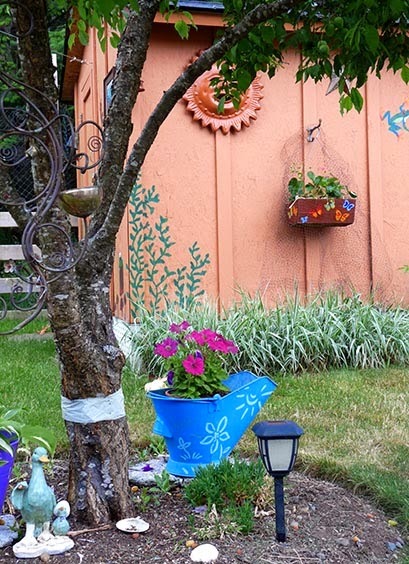 One could imagine walking through the door and finding a lovely garden studio gallery. I never tire of organizing and attending workshops. This past weekend was no exception. 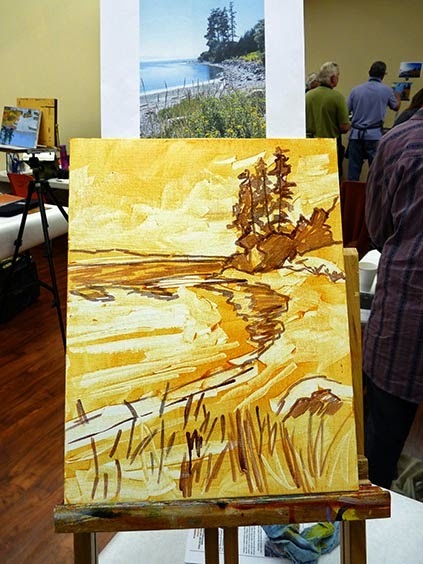 Almost two years in the planning, it was our pleasure to host David Langevin for a painting workshop; his first on Vancouver Island. Three days may sound like a long enough time, but the days just flew by. Friday we worked mostly on theory; properties of paint, etc. It's a good idea to have a clear understanding of your materials. Notes were made, great questions were asked and answered and many laughs made for a fun and informative day. 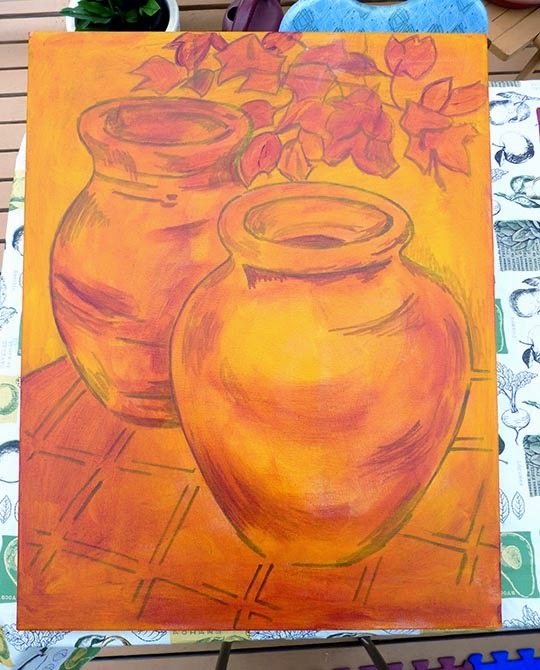 We had time in the afternoon to practice glazes and veils. Day two we worked on a painting using glazes and veils, as the old master Caravaggio painted. David says "Now take the glaze and brush it across the entire surface. Understand? Now you try." Day 3 we tackled a grisaille painting; a method using different shades of grey. Once you have a strong value painting, you then add the colour. 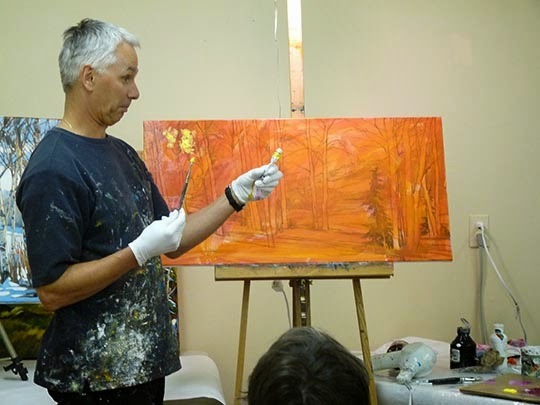 We all enjoyed David's 'magic' as he went through his process of working on a painting. It brought on great discussions, conversations and lots of laughter. Starting with a detailed drawing on the canvas, he puts a warm glaze over the entire surface. 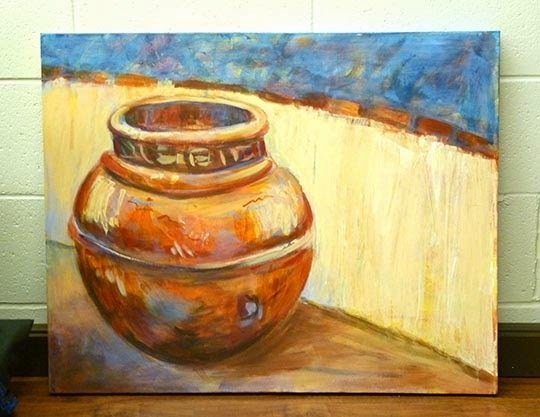 More glazes, more colour, more discussion - the painting quickly came to life. Looking good now! Asked if it is finished, David says "Nope, not yet." David is a master of the old masters. As David says "Only David Langevin and Caravaggio paint this way". 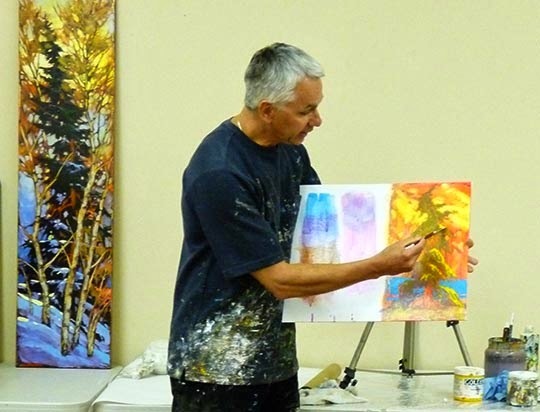 I love to organize workshops and bring in wonderful artists to learn from. We keep the class size limited to 12, which makes for an intimate and comfortable group. 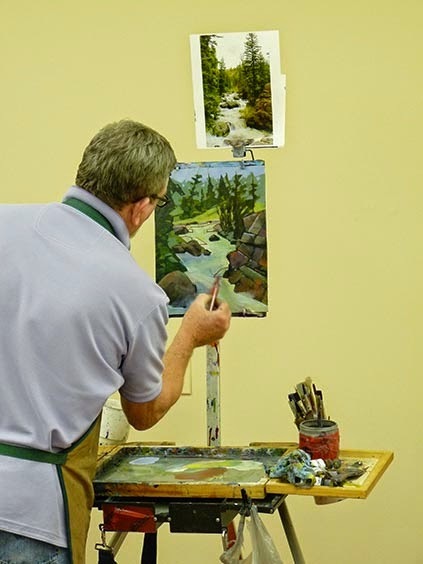 It's fun to spend the weekend with like-minded artists, a chance to meet new people and to sharpen one's painting skills. Plus, if the mood moves me, I often make fresh cookies for our morning break. Check out our website for upcoming workshops. See you at the next one. 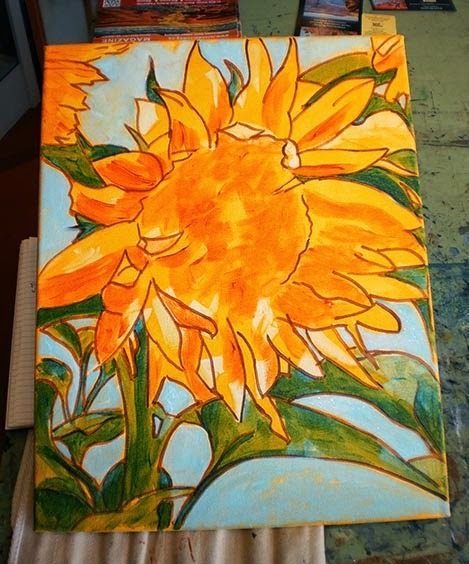 This past fall as a way to capture the beauty of my gardens, I decided to give myself a challenge: a painting a day for two weeks. 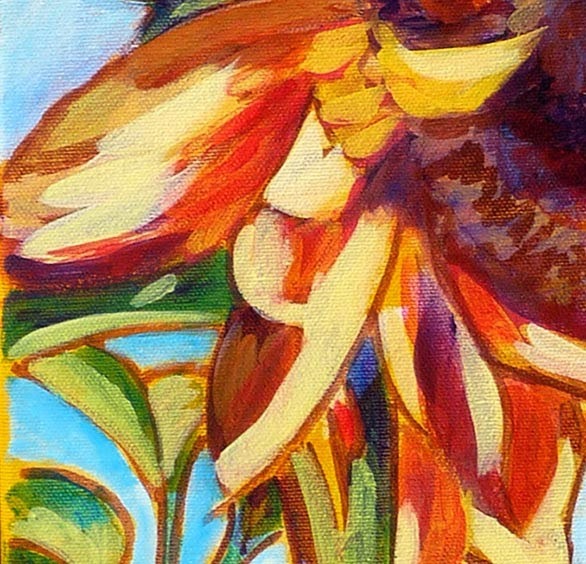 The challenge was this: to do a painting each day, to paint quickly and not to fuss over details. Sometimes a person tends to over work a painting, which often leads to undesirable results (or as we say, mud). When painting quickly, you must make fast decisions, and execute them faithfully. Here are the results of my two week challenge. I encourage you to try this exercise, even if only for a week.